Check out our YouTube Channel to see examples of TS Trimmers in action. 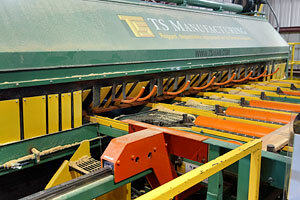 TS Lineshaft Trimmers have developed a reputation of high production and low maintenance. 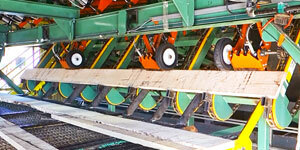 Capable of servicing the needs of Sawmills, Planing Mills, and Concentration lines at speeds of 180+ lpm, they offer a versatile and simple system for trimming lumber. Our rugged Lineshaft Trimmer is built with a tubular construction main frame, designed to withstand the rigors of operating at 200+ lpm with high thickness ranges. 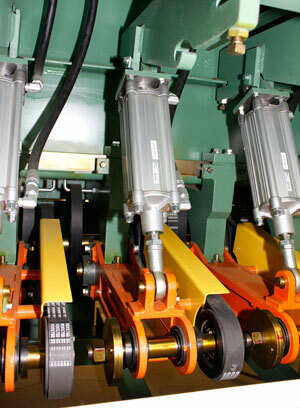 A common question about Lineshaft Trimmers is: How do you make belt changes? 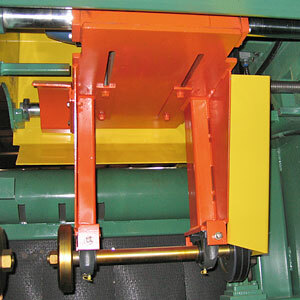 The TS Lineshaft Trimmer ensures that each belt is accessible without the need to remove bearings. This is achieved via split mini-lineshafts between bearing mounts. 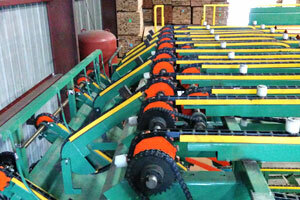 Each coupling allows access to 4 saws. 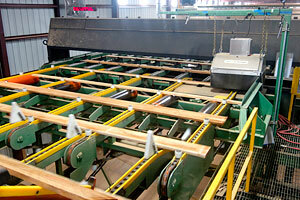 Integrated spare belt storage allows up to two belts to be stored with each saw. This allows up to 8 spare belts to be stored for each coupling, preventing the need for long downtime in the rare occurrence of a belt failure. Belt change is a quick and simple process - doable by a single person in under 5 minutes. 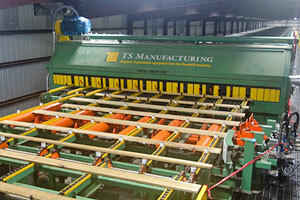 TS Lineshaft Trimmers typically have saw spacings from 1 to 2' (300-600mm), but can be configured for less. For challenging length requirements, we offer multiple sawbox configurations (for Precision End Trimming) as well as flying or adjustable 0' saw arrangements. 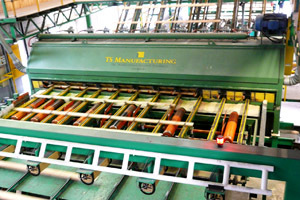 Each TS Trimmer is provided with an integrated 'gull wing' door system, (including pneumatically operated doors and safety bar), ensuring the system can be safely accessed when the pneumatics are isolated. Available from 40-150+ hp, the sawbox is always able to provide the required cutting power, increasing belt life in high speed applications. Modular design in the TS Lineshaft Trimmer allows for the flexibility to meet demanding length specifications. 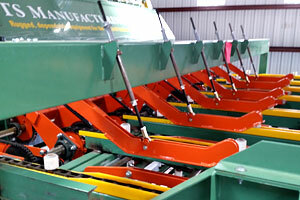 The pictured 1' saw spacing still provides rapid access for all belt and saw changes. 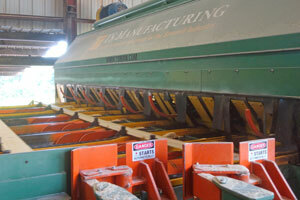 The turbulent trimming environment is contained between the saws and the waste conveyor by simple UHMW guarding. 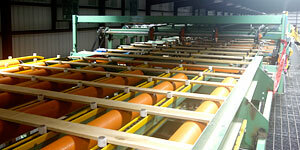 This eliminates the potential for trim blocks to get into the belt and pneumatic areas. 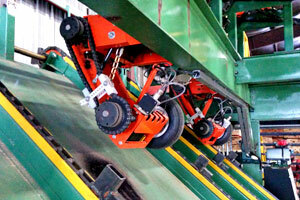 Saw belts are easily accessed without removing the guards. An available feature of the TS Lineshaft Trimmer is the mini-adjustable 0' end lineshaft. This system is becoming more popular as the drive for efficiency necessitates ever more flexible solutions. A fixed down adjustable 0' saw is the most basic way to provide adjustable trim lengths to a lineshaft trimmer without the more complex 'raisable' flying saw solutions. Like all adjustable 0' end saw systems, this system is available as a manually adjusted 'crank' set point for production run sets, or as a linearly adjustable precision flying saw. In a flying application, the fixed down saw may limit lug speeds. 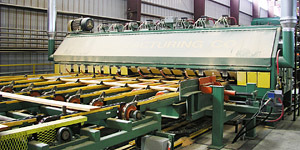 For higher speed applications, the raisable flying saw system offers the flexibility of precision end trimming with near infinite trim capability (including infinite cut-in-two solutions), without the need for a multi-sawbox solution. 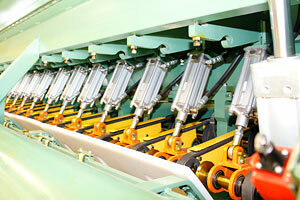 Each 'Maxi Trim' or Flying Saw solution is powered by a separate and guarded mini-lineshaft motor. identical to the rest of the trimmer for interchangeability. The integrated dust collection system includes access vents around the flying saw to ensure fugitive dust is controlled. The entire flying saw system runs on roundway slides for low maintenance and long life, without the need for fragile 'linear bearing' systems in the trim box area. TS Trimmers offer fenceless 'manual' infeeds, flat fence, and 1-4 trailing arm linear fences as solutions to your footprint and piece count requirements. For manual infeeds, TS fenceless systems are an excellent option. For systems up to 45 lpm, the 2' setback, flat fence is available in both multi-stage pneumatic and linear positioning options. In both 1' and 2' spacing trimmers, the simple and effective trailing arm system is a reliable, low cost, high performance solution (150+ lpm). If required, a TS Trimmer can be provided with a more exotic moving fence solution. For applications requiring a 'cut-in-two' solution, the separately driven 'make-a-lug' transfer creates a lug space without the need for clutch drives or other high maintenance alternatives. This is done through a triple drive transfer mechanism that makes empty lug spaces at 140+ lpm, without the usual jerk seen in 2 stage make-a-lug systems. For high speed optimized solutions with complex grading requirements that can't be satisfied by Automated Grading Vision Systems, we offer a Grade Mark Reader in front of an optimizer system. 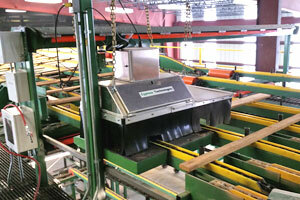 This system provides complex grading zones for the optimizer in its pursuit of high value pieces. For applications that utilize this advanced scanning technology to detect out of spec lumber and send it to a resaw for reprocessing, we offer a tipple in front of the trimmer that can also be separately driven and serve to 'make-a-lug' for a 'cut-in-two' application. This allows pieces to be re-sawn without being trimmed. For systems without optimization that still require precision length measurement, we offer a length sensing system that is accurate to within 0.125". 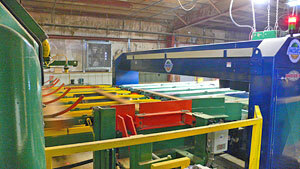 This system also utilizes opposed beam thickness measurement and snapshot width measurement. On a reduced budget, TS photocells at 1' increments, with an encoder, will get length and width data for automated trim decisions. We can couple grade mark readers with simple length sensing and 3D optimization systems. Additionally, we can provide systems that utilize fixed grades or grade input consoles as other options to the grade mark reader. 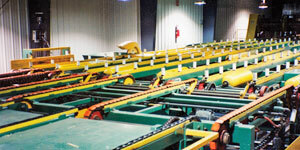 Overhead Printers on the Outfeed to provide 'bin sorter' functionality on a Pull Chain System. This provides either simple 'tally & sort' info, or per piece data with Per Cart Export Capable Ticketing. 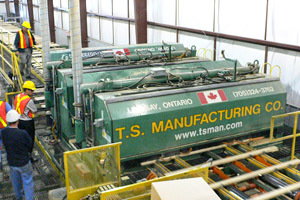 Canadian or 'Valley' Style Trimmer Systems - Ideal for a Two Man Trimming System with lower production requirements. Offers simple maxi-trim, cut-in-two and flexible trim solutions, without requiring the additional length of a Lineshaft Trimmer System.